John Emory Conner was a native of Hamilton County and a farmer by trade. In 1876, at the young age of 21, he began six years of service as constable for Chattanooga. In 1882, he ran for sheriff but lost to William T. Cate, who was killed that same year by John Taylor. 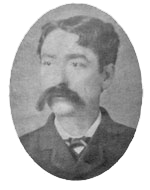 Conner worked as a foreman in a local department store until he was elected sheriff in 1886. He also served as tax assessor for four years. After finishing his term as sheriff, Conner tried farming and real estate sales until his appointment to postmaster general of Chattanooga in 1913 by President Woodrow Wilson. Beginning in his youth and maintained until his death in 1916, Conner had strong Democratic political ties, taking part in several campaigns held throughout the county.